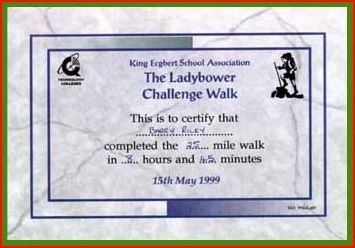 I did this 25 mile walk with Mick on the 15th May 1999. The day was dry and warm (rather than being hot) and the route was generally enjoyable. Originally the start/finish was at the St Ecgbert Secondary School in Dore, which is to the south west of Sheffield. However, having checked the distance between check points using my own design Grid Reference Distance Calculator I realised that as the "crow flies" the total distance between check points was 23.73 miles. Walking, I estimate the total distance would have been almost 30 miles. The organisers – St Ecgbert School Association – also realised the error a week or so before the walk and competitors were duly informed the 25 miles would be completed when the final checkpoint at Grindleford was reached. Thus it was that the finish was at Grindleford, but more of that later. 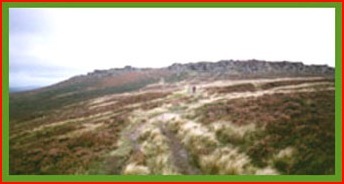 Having left Dore, a staggered start, we walked generally westward, climbing all the time along minor roads until we reached and crossed the Sheffield to Hathersage Road. From here we took a path across quite boggy moorland to reach Burbage Edge with views westward over Carl Wark and Higger Tor - I always think these are funny names for hills. We followed the top of the edge northwards to get to the first check point at Burbage Rocks which was at the bridge over Burbage Brook on the Ringinglow Road. - another name to conjure with. I think if I did this walk again I would probably drop down off the Burbage Edge as soon as I reached it. The path below seemed better than the parallel track we took "on top", and we also noted that walkers that were behind us had got in front by taking the lower route. I’m sure they weren’t walking faster! A swift drink was enjoyed at "the rocks", which according to my calculation was just over 4 miles from the start. 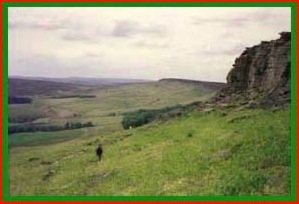 The next check point was originally to be on the Strines Road (A57), at the north end of Stanage Edge. However, the final instructions did away with this "stop" and Check Point 2 became the car park by the Ladybower Dam (SK173892) which, in a straight line, is 6.94 miles away. Although the intention was that competitors should still go via the north end of Stanage Edge, by removing the Strines Road Check Point it gave walkers the chance to find short cuts across Moscar Moor and missing out the uphill and downhill work on Derwent Moor. I understood after the event that the organisers were not too happy with this and would be reinstating the Strines Road Check Point for future events. Mick and I had thought about crossing the moors but we were both keen to walk " Stanage". However, although we walked the first part on top of the edge when we reached Long Causeway we dropped to the lower level path so we could enjoy looking at the rock faces on our right and spotting discarded millstones as we travelled northwards to Strines Road. The millstones that are found here always fascinate me. It’s almost as if the quarrymen and carvers were told one day " we don’t wasn’t millstones any more" and they just stop making them. This was very enjoyable part of the walk, but we realised hard work was ahead and the crossing of Derwent Moor. We walked about ¼ mile westward along Strines Road. We then turned off right along a minor road before taking a left turn on to the right of way that would take us across a ford, past a number of Grouse Butts and the toil to the top of Derwent Moor. From here we dropped down to the Ladybower just to the north west of Grindle Clough. I had enjoyed the "dropping down" but the walking up had been difficult. The moors had been very soggy and muddy in parts due to the recent rainfall, which always makes up hill work difficult and tiring. Now it was an easy and pleasant walk northward along the minor road to the Ladybower Dam and Check Point 2, refreshments, and a play around with my boot that needed adjusting as my feet did not feel too comfortable. We had now done almost 13 miles. Half the walk had been completed. The next check point was in Hope, which I estimated to be between 4 and 5 miles away. I had worked out our route on the map. I’d actually written details of the lefts and rights, and ups and down. This made navigation easier than keep referring to the map. And so it was uphill to Lockerbrook Farm, where we came across 6 or 8 motorcyclists using the path past the farm to show their "rough riding" ability. This was very much to the annoyance of the farmer’s wife who was shouting and waving her fist at them. They were going north and we were going south and soon we were descending to the Snake Road. It was somewhere on this descent that Mick and I, and another couple of walkers we had befriended took a steep shortcut at a hairpin bend. I shouldn’t have done it. My bootlaces had worked loose again and I stubbed the toes on my left foot as it slipped forward in my boot. The toes, and one in particular, were painful for the rest of the walk. Needless to say I am now more wary of steep downhill short cuts, especially if my boots become loose. From Snake Road we went uphill to reach the course of the old Roman Road that was a pleasure to walk along, even with aching toes, with superb views to the west towards Lose Hill. It did not seem long before we were descending into Hope and the last check point before Grindleford. It is rare that you undertake a walk that is enjoyable all the way. The downside, as far as I was concerned, was the trek between Hope and Grindleford, which generally follows the River Noe. It was not unpleasant but after a while there was sameness about it. My toes were aching, I was getting tired and between fields there were stiles, which break your rhythm when you are walking, and they seemed to get higher. It was therefore a relief to leave the south side of the river, where we had been walking, cross to the north side and after a short uphill pull, passing under a railway bridge, we were soon at Grindleford - journey’s end. Finishing at Grindleford was a real bonus. We finished at the Grindleford Cafe, which is licensed to sell wine, spirits and beer. It’s not often we finish challenge walks next to a "pub". And so we took advantage and enjoyed a pint in the sun while we recovered and waited for transport to take us back to St Ecgbert's for food. It had taken us 8 hours 45 minutes, a mile every 21 minutes. I wonder if we could have done it quicker if I hadn’t stubbed my toes? Needless to say over the next few months one toenail got blacker and ultimately came off. Better make sure I cut the toenails shorter next time, lace my boots tighter and take more care on descents.